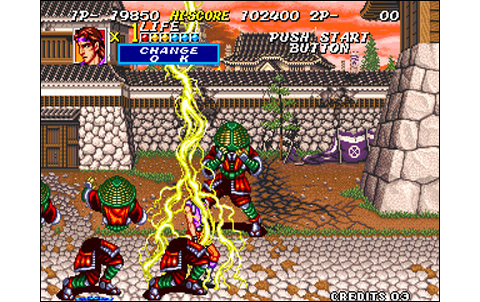 Let me be clear with you dear readers before this review: for me ,Sengoku 2 still stands as one of the best Beat 'em Up ever released for the Neo Geo. For sure, one can't say that the system was particularly lucky with this kind of games, but we can't say either that it was a total disaster. 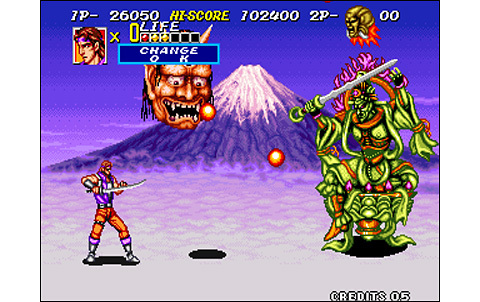 Capcom clearly took the lead in the early nineties in this niche, as its rival prefered to devote every resource he had into another battle. 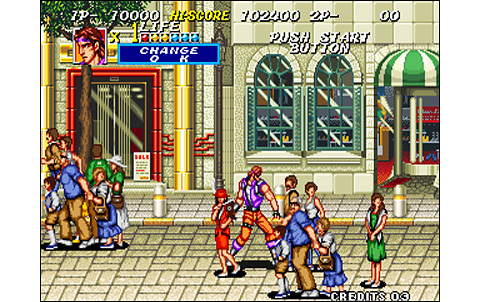 If SNK had so far applied to provide us as good BTU as they provided us VS fighting games, that would have been another story. 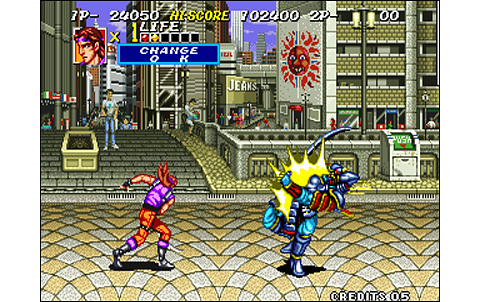 That said, there are still some good titles in this very genre on this system: Mutation Nation, Robo Army, Burning Fight, and especially the Sengoku series, with three games that stand as pretty decent. Concerning the latter, three episodes were made in this saga. 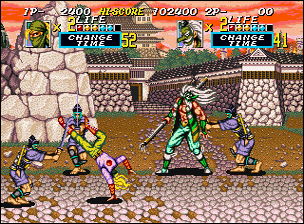 All were good games, but Sengoku 2 stands probably as the most stylish, the most personal, and the most epic ever. A Goddess came to bring our heroes to achieve their destiny. They will return into past and change the course of time, as the events were dramatically modified by evil forces. This will send you through the past at different eras, but you'll also be drawn into parallel worlds, where you'll have to deal with horned demons and ghost creatures. 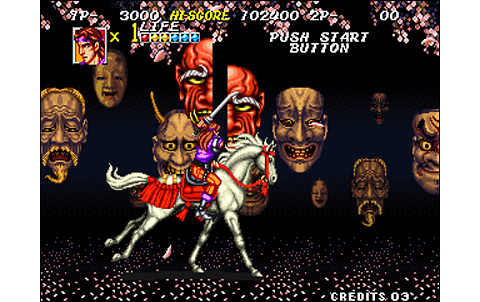 Starting with the 'how to play' sequence, Sengoku 2 immediatly makes you want to play! 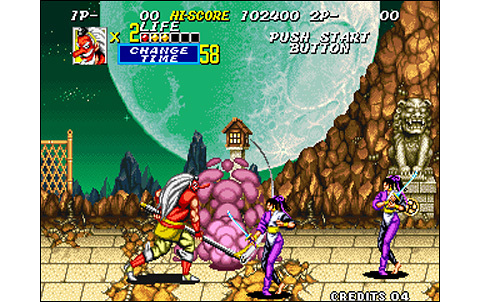 Riding horses, taking four forms of warriors (modern samuraï, ninja, ninja dog, and kabuki), special fireball loaded by depressing three buttons, guard, two different slashes, jump, power-up... the gameplay looks wide and interesting! The intro duction of the game looks good, and the music puts players in the mood right from the beginning. And as the war drums come in action, we know it's now time to fight! Players are starting the adventure in the sixteenth century, in a feudal japanese village devastated by war. Visuals and sounds immerse you immediately into the action, it's amazing. 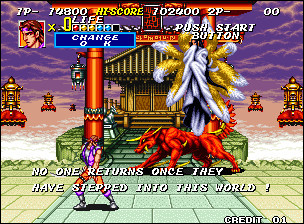 And through the different level, you discover incredible varied stages, since you'll be regularly teleported in totally fantastical parallel worlds, inhabited by improbable vile creatures. But there's also other places, in other times... I won't say more, it's up to you to discover! 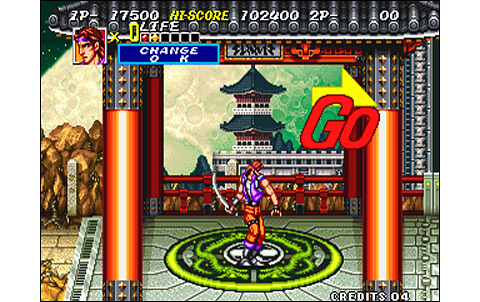 Graphically, the game sets the level very high, with beautiful drawings using a wide palette of colors. There a very few passages missing a little relief, but overall the game is sublime: scenery and characters are downright superb. We travel through different eras, and each set features an unique atmosphere, with its own characters and effects. 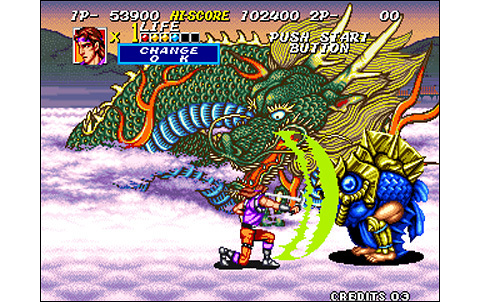 Battles in the parallel world are maybe the most epic, with incredible dragons and marvelous stages. The animation, if it's successful enough, is however a bit stiff and our characters don't move too fast. 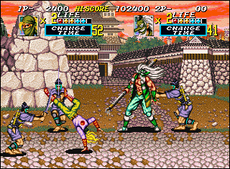 We would have liked it a little more dynamic, althought it's still doing good, way better than Sengoku. 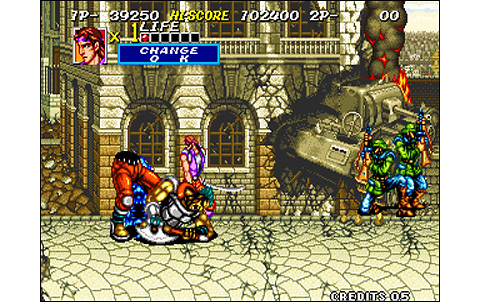 The soundtrack on its side is absolutely awesome, the music mixes perfectly with the atmosphere of war, and sound effects are amazing, in addition to be numerous and varied. Overall, the realization reaches a high level, never seen before on the system. 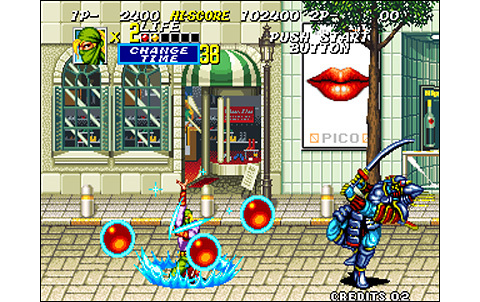 The game also features a technical gameplay, pretty complex and taking, as described above. 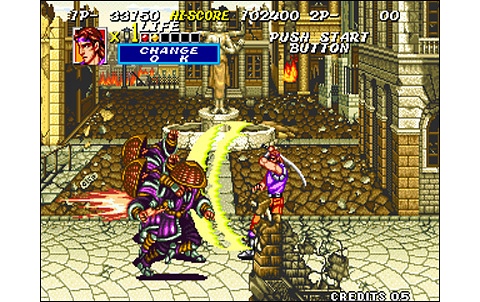 The attacks of the various characters are numerous, there's also the power-up and special attacks, plus the guard giving a new dimension to the fights. 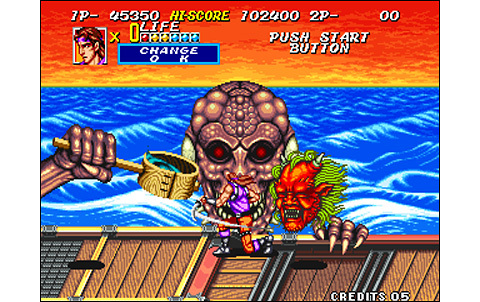 Bosses are often grandiose, and require a lot of concentration to be defeated without losing too many credits. Replay value remains the biggest flaw of the game: the five stages are really too short in terms of length. 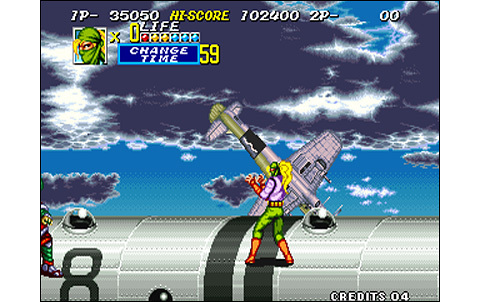 Anyway, clearing it within the allowed credits still seems a hard task, as SNK set the difficulty level very, very high. It should be mentionned that the cooperative play provides more interest to the action, bringing new combat tactics and the pleasure of slicing demons with a friend. 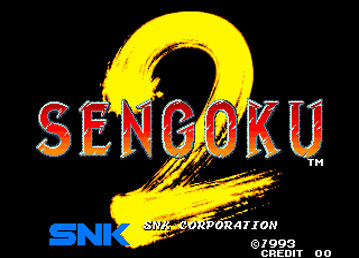 Sengoku 2 is a magnificent Beat 'em Up, with a strong gameplay and an awesome realization. However, it still packs two defects: the animation is a little stiff, and the lifetime too limited. 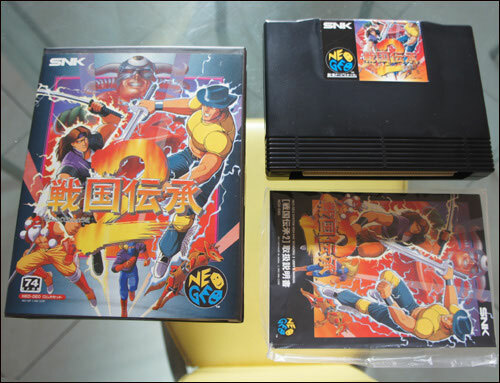 Despite these few things, this game remains one of the best of the genre on the Neo Geo, a must-have for every Neo Geo owner who loves BTU. 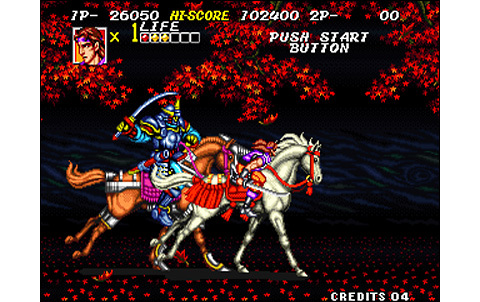 Feudal Japan is gorgeous, both for the environments and the various characters, colorful and stylish. A little stiff, our warriors could have moved a bit faster and smoother. It's still more than decent, with good decomposition and intense action. Sound is probably the greatest part of the game. 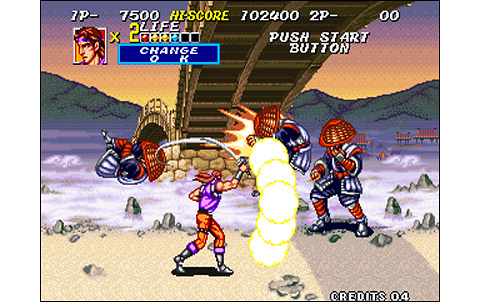 The war themes are epic, sound effects pretty cool and vocals astonishing with the intermediate screens punctuating the action. 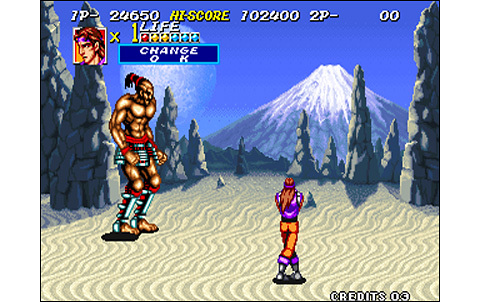 Shorter than the first episode, the game is cleared within forty minutes. 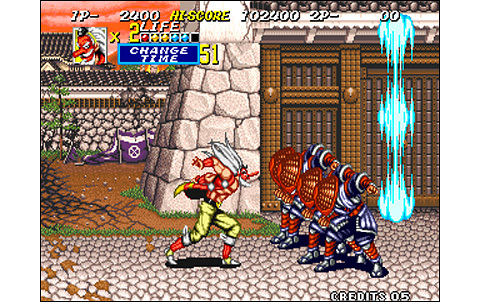 Four different warrior's forms, vast array of moves for each one, with special powers, possibility to block... What a wide gameplay! An awesome Beat them Up, a little short, but packing a very nice realization and an incredible atmosphere. 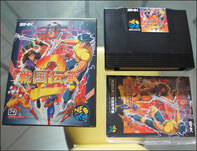 The price of the game is between 150 and 200 euros. 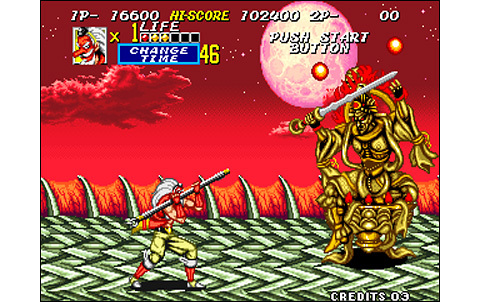 Sengoku 2 is one of the best Beat 'em Up on the Neo Geo, but this said, the value/money rate is not in its favor because of the short lifespan. For Beat them Up lovers only!